Speaking of Freedom:"Why We Prepare"
Our next Macon County Patriots meeting will be April 30 from 10 to 2 at the Church of the Open Door in Macon. Continuing with our theme of "Family Preparedness", our topic for this session will be "Communication". (Rumor has it there will be a working ham radio set there!) We'll enjoy a meal together, too. So bring a dish and join us. This Easter season, as I have reflected on what it means to be prepared, something has become clear to me in a new way: God is a preparer! One of my favorite places that demonstrates this is in Revelation 13:8 where the Bible refers to Christ as "...the Lamb slain from the foundation of the world." It is as though the Father, Son and Holy Ghost had an executive meeting and decided that, if they were going to create the world, it would be necessary for Christ to come to earth and die to redeem fallen man. If He had said, "No. I won't go. ", nothing would ever have been created! 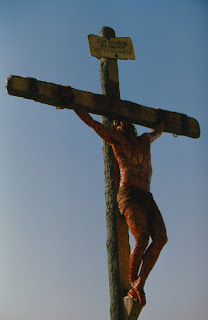 Of course we now know that, out of His great love for us, Christ said "Yes, I'll go." So Christ did not come to earth by happenstance but by God's design! This is what we celebrate at Easter. I share this now because, so far in our meetings, we have not delved very deeply into the question of why we prepare. These reflections have helped me put things into a new perspective so as to help me answer that question. I hope you will find it helpful, too. 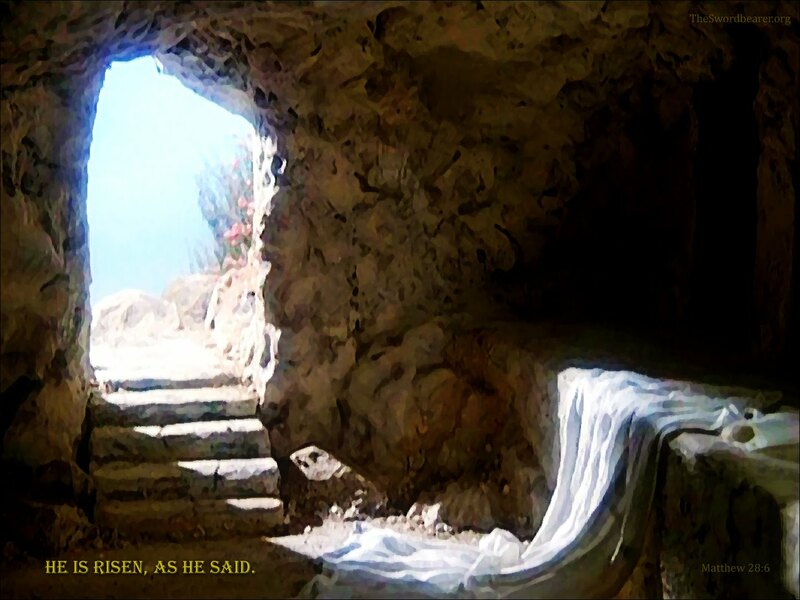 And if America is to be resurrected, (and that is what she needs), and if our patriotic efforts are to bear fruit, it will only happen by the power of the God of the Resurrection who raised our Lord Jesus from the grave on that first Easter. So I want to be prepared so I can be around to help point people to Him. 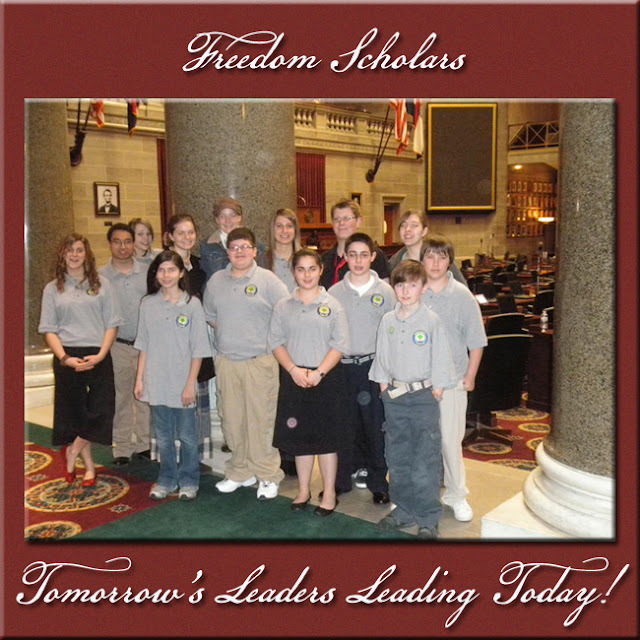 If you've never heard of this group before, fasten your seatbelts and get ready to meet an incredible group of young people who are making more of a difference in Missouri today than the majority of adults you know. 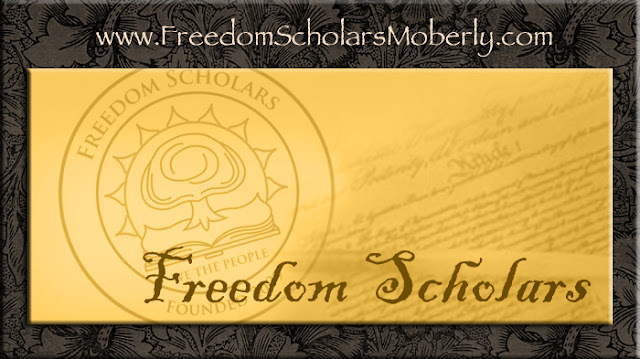 These are the Freedom Scholars. I've had the pleasure of working with the Freedom Scholars and it's hard to describe their rock solid character. I have to say, they are my favorite Leaders today. 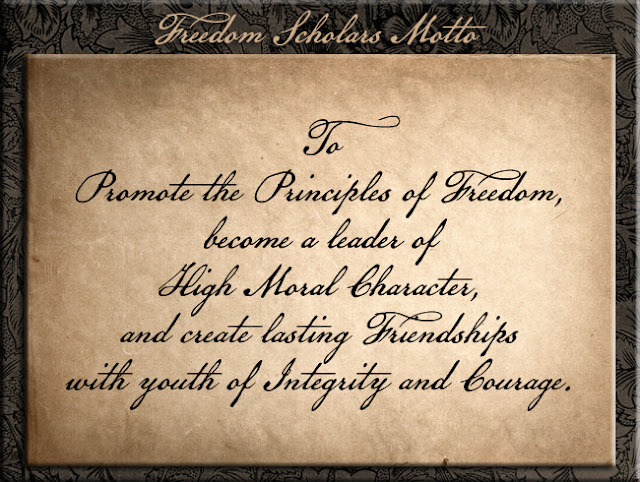 To introduce them to you I am re-posting an article by one of the 16 year old Scholars, Kelci Weidenaar. An opportunity opened up for them to spend a day at the state capitol and Kelci describes the events of the day in a way that makes you feel like you're along for the ride. The large ornate structure of our Capitol in all its elegance stood monumentally before us. Its tall slender pillars and marble steps were a picture of beauty, but also of foreboding. Climbing them that day, I could only wonder what lay in store for us behind those large doors. People strode confidently through the halls, papers tucked under their arms with the pin of LA, Representative or Senator secured neatly on their suit coats. These were the men and women that shape our State. I pulled my bag up on my shoulder, restraining the desire to rummage through it again to make sure the few questions I had written up about a bill were still there. I don’t know about you, but the Capitol building has always seemed to me like some foreign place where ordinary, elected people were suddenly transformed into a mass of faceless, bill writing machines, mechanically destroying or helping our State. As I watched many walk by me, I tried to read the look on their faces, but whether due to nervousness or inability, I couldn’t. The rest of our group joined us and we were quickly briefed about our day and how to go about talking to these foreign people. We were then ushered into the big-guy’s office, Rep. Tim Jones, the floor leader. (If any of you reading this don’t know what a floor leader is, which I didn’t until recently, it means that Rep. Tim Jones is the person who is in charge of deciding which of the bills get to be discussed and voted on in the House. To say that he is important and busy, is like saying Missourians like to hunt). We stepped into his office and I tried to find a chair to stuff myself in. At a glance, his office was just as I expected. A big, daunting desk stood as the focal point of the room with chairs and a couch in front of it. Behind it stood dark brown shelves filled with leather bound books. On a closer look however, as we waited for Rep. Tim Jones, I began to notice some softening details. Pictures of his family. He had two cute little girls. A few framed pictures of dogs. A dog lover? And then he came in. He did have a face and on looking at it I realized that he was probably as nervous as I was. I was slated to ask questions first, so hastily I pulled out my notes and dove into the questions I had on his bill #213 to end late term abortion. What did viable mean? Did the bill give room for doctors to brush aside a baby’s life? After a couple of questions, we all began to relax. His answers were encouraging and I was proud of the thought that had gone into the making of this bill. He was the sponsor of another bill too, one to reiterate our right to pray in public places. As our time came to a close, we were all offered refreshments. I didn’t take any, I already felt refreshed. Clomping down the echo-y hall to meet up with Rep. Paul Curtman, I turned over one of the new facts I had learned. There were only about fifteen lawyer Representatives, Rep Jones, being one of them. The few lawyers were taxed with legal questions from the others. I don’t know, I guess I just assumed all politicians were lawyers and knew exactly what they were doing. A glimmer of an idea began to form in my mind, but I set it aside as I looked up curious to see if Rep. Paul Curtman, too, had a face. He did. His was not that of a lawyer, but of an ex-marine. His eyes sparkled as he talked about his years in the service. After serving our country on the battlefield, he realized that if we didn’t fight at home there may be nothing left to fight for. He was working on a bill that will make it illegal for US justices to use foreign law. “Another nation’s laws don’t represent us,” he said, “So they have no right to make rulings with them.” On the rising issues of Federal government control, he didn’t bat an eye to declare that he stood for State sovereignty. Being a man who understands authority and order of leadership, his words held even more weight. He’s even written a book on it called Don’t Tread On Me, which was the popular cry for our early patriots. His zeal for our nation and its Constitution was inspiring. I was quick to stand up and shake his hand at the end of his talk. After years of serving in the marines, I felt honored that he chose to serve us yet once again. We were on the move again walking through two huge double doors onto the Senate balcony, there we were introduced by our Senator, Kurt Schaefer, and then we were off again to the House. We actually got to go on the House floor where we were introduced by our Representative, Randy Asbury. Other Reps introduced guests before us; they all seemed to be classes of second graders. When we were introduced as Freedom Scholars and explained as American youth zealous for our freedoms and educated on the Constitution, the floor erupted in applause. Reps stood to clap. To see a large group of concerned teens must have been a breath of fresh air. The idea that had only vaguely presented itself before leaped to the forefront. Maybe I, a teen, really could make a difference. After leaving the House, my ears still ringing with their welcome, we went to a place so we could talk with our Rep. Randy Asbury. He was the last nail in my idea of the faceless Capitol inhabitants. His face was neither that of a lawyer or of a marine, but that of a father. He’d sacrificed precious time with his wife and children to be here. “I’ve lived a full, happy life,” he said. “I am here to make sure that the next generation will be able to have a life as blessed as mine.” He encouraged us to continue to grow up to be leaders of integrity and faith. We will ultimately decide what this country will be like in the decades to come. Are we prepared for such a task? Can we stand firm for what is right? We returned to the House to watch just such an opportunity, the debate on Rep. Tim Jones’ bill on the ending of late term abortion. There was heated discussion as it went back and forth. My heart swelled with pride as Rep. Asbury, my Representative, stood and calmly stated his argument right after a most heated comment. Facts were brought up and were countered with other facts, much research and thought had been prepared for this moment. I watched intently, feeling especially close to the issue as I had just been in discussion about it with its sponsor, Rep Tim Jones. The excitement was contagious. Sadly, we had to leave before the vote was cast, to meet up with LA (Legislative Assistant) Read, but I found out later that it passed the House with 119 ayes and 38 nays! It’s now in the Senate. With the enthusiasm still flushing my face, LA Read led us up the endless steep steps to the Whisper Gallery. You could just hear the hum of the countless people bustling below us, working on steadily. Working to represent us. From up there they did look faceless. I couldn’t help smiling at the thought, for I now knew each and everyone had a face. A unique face. Even if their face didn’t reflect my own, my respect for them didn’t change, for they were sacrificing time from their families to make a difference, which is more than I could say about most people, even myself. Today had shown me that it wasn’t impossible, with a little time, a little research, you can make a difference, even if it is only encouraging those who are. It can be done. We stepped from that room and spiraled up even higher to stand in the top of the Dome itself. We stepped outside and were blown away by the view. Missouri sprawled out in every direction. The Missouri River, a wide ribbon, wove through its fabric. The sky and land pooled into one in the distance of this broad and bountiful homeland. The people below bustled about in the precious freedom each new gust of air seemed to bestow. I breathed the air in deeply. This was what it was all about. 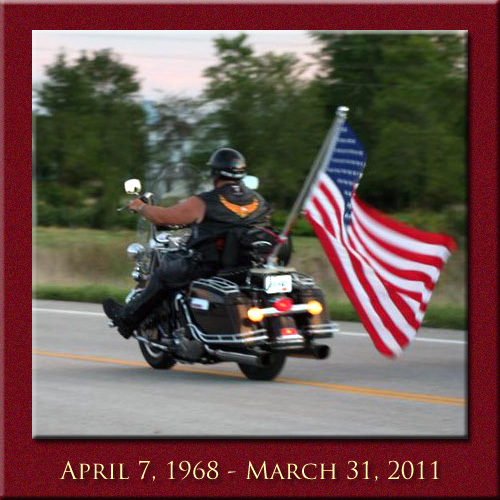 March 31st 2011 our community suffered the loss of Todd Phillips... suddenly... unexpectedly and with heartache in a motorcycle accident. Todd was a man that knew no strangers, greeted everyone with that familiar smile, a warm embrace and a strong handshake... and a look into your eyes that gripped you. I don't know if we ever heard Todd speak disparagingly of anyone, it just wasn't in his composition to do that. He possessed a love of family, community, friends and his country. His personal, religious and political convictions were strong, vocal and heartfelt. Unwaveringly. Todd earned respect as a Patriot who was willing to put himself into positions where he could express his convictions by serving. His respect and humbleness for those that serve our great country was very strong, he rode with the Patriot Guard Riders to honor our fallen. He held in his possession a cluster of life experience that most of us would be jealous of, and he built upon those experiences to become everything that Todd Phillips was. Our community's loss is huge and felt deeply by all. 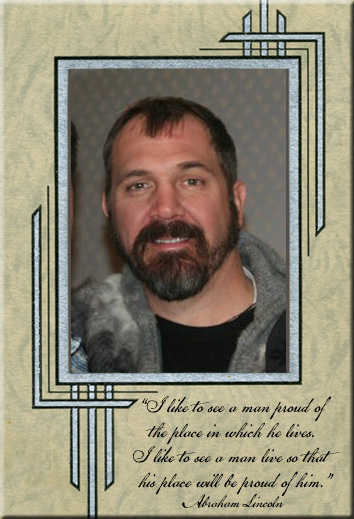 Todd, we'll miss your presence among us.